Educational digital libraries (DLs) are grounded on the premise that educators can do a better job with less effort if they can easily find and reuse materials that are created by others (1, 2, 3, 4). In this model, success is predicated on the ability of the DL to engage its community in building relevant and useful collections and in using these resources to enhance teaching. In this article we highlight some key approaches that have been successful for the Science Education Resource Center at Carleton College (SERC) in engaging geoscience educators, both as contributors and users in the Teach the Earth library. Educational DL efforts have faced two major challenges in recent years. First, creation of digital libraries that add value to the resources they index has proven to be labor intensive (5). Much of this added value lies in providing context for resources  for example, links between related resources, information that describes how and when resources can be used effectively, or collections of resources that address specific educational issues (6, 7, 8, 9, 10, 11). Creating this context requires professional knowledge of the resources and of the target user population, is still largely a human endeavor and, as such, is labor intensive. Second, educators, in masse, have been slow to adopt the use of digital libraries (12). Faculty and teachers do not routinely go to the web to find the materials developed by their colleagues for adaptation and use in their teaching. While such behavior could arguably be more efficient and improve instruction by spreading the use of highest quality resources, a culture supporting this behavior, particularly at the undergraduate level, is not yet in place (13). The Teach the Earth digital library for geoscience education arose from our work collaborating with a number of professional development projects to enhance their efforts through the use of the web. By integrating the use of DL tools and services into this work, we were able to bring the expertise and efforts of this professional development community to bear directly on the challenges facing education digital libraries. Our partners have been particularly effective in three areas: creating a DL rich in contextual information, creating processes for community contribution and enhancement of these resources (14, 15, 16, 17), and integrating the use of the library into the professional development of geoscience faculty and teachers. Creating a library from the work of a group of partners naturally led to a networked, non-centralized approach to search and discovery of resources. Resources of interest within our library can be identified from many dispersed starting search points, yet once a single resource in the library is accessed, the associated context and framework for that resource and all associated resources are apparent. As shown in Figure 1, the resulting library design emphasizes the relationships between resources as well as tight integration between library resources and the context needed for effective use. This approach explicitly attempts to align with the diversity of users' information seeking strategies: use of commercial search engines, trusted sources, and links (18). Thus we avoid the issues associated with relying on a centralized portal to bring users to the site while addressing the important need for context to support the effective use of our library resources in geoscience education (6, 7). Bold blue boxes and arrows represent areas where DL value is added as users navigate to content (thin black boxes). In the traditional educational DL, only users who actively decide to use the DL portal benefit. In the networked model, much of he DL value is integrated into the content and presentation of the sites themselves, and so impacts a wider range of users. This approach carries with it some major challenges. Bringing together the work of individual projects, each with its own leadership, goals, identity and passions, requires flexibility. It is more difficult to impose uniform standards, to require review using a specific process, or to mandate the breadth of library holdings. Creating an integrated network from these resources requires knowledge of the breadth of resources and the breadth of user communities. To date, we have worked within a community we know well, with a limited number of partners whose resources we know well. As the size of our library increases, the number of partners grows, and the diversity of users expands, our methods must be developed into scalable models. Our network model for navigation, while promoting exploration, can sometimes leave users feeling lost in the woods. As we move forward, we will need new tools to better understand our users' movement through the library and scalable guidelines for creating a network that supports and leads rather than confuses. We have only begun to address these challenges of a mature digital library. Below we describe our work in implementing this community DL model through a set of services that enabled geoscience education projects to collectively build the Teach the Earth educational digital library. We focus on three aspects of this work: 1) facilitating community publishing, 2) creating a navigational and organizational framework that integrates the work of all included projects into a DL, 3) and identifying the ways in which the network centric DL that results from these efforts meets users' needs by complementing their natural search behaviors. A successful educational digital library is as much a social process as a technical problem. It requires creation of a culture that fosters contribution to and use of the library (5, 8, 9, 11). We have addressed creation of this culture by working with NSF-funded projects focused on the professional development of geoscience faculty as teachers. Each of these projects partnered with SERC to create its project website. They seek two primary services in this partnership: 1) tools, resources and experts that assist them in creating high quality project websites and 2) placement of their resources in a network that enhances dissemination and use of their work. We created a win-win situation that yields rapid production of content for the library and facilitates use, by allowing our partners the flexibility to meet their own project goals while contributing to the overarching digital library. While the contributing projects all have different goals and strategies, they share a focus on creating resources that improve geoscience education and bringing them into widespread use by faculty and teachers. Two strategies have been particularly effective in creating content for the library. First, the projects, which bring substantial professional expertise, contribute resources central to their work in geoscience education and professional development to the library. For example, the On the Cutting Edge project (19) used the content of a set of very popular workshop notebooks refined over five years of program development to create library contributions on preparing for an academic career, managing your early career, and designing effective courses. These resources are now in widespread use within their workshop series, bringing users to the library as an integral part of their professional development. Second, a major goal of many of our partnering projects is to draw on the expertise distributed throughout the geoscience community and convert it to forms that are shareable through the digital library. Geoscience faculty rely heavily on informal sharing of information between colleagues to inform their teaching (20). Using workshops, editorships, professional society sessions and collaborations, our partners have engaged more than 400 scientists and educators in writing materials for their project websites. This work is inculcating the use of the web as a vehicle for more widespread sharing among colleagues. By aggregating and integrating these contributions, the library provides a robust source of community expertise, and these contributors become agents for promoting use of the library by their colleagues. Our work with partnering projects has resulted in robust collections of resources that are rich in the contextual information now recognized as central to the value of educational DLs (10, 11, 20). Developed as tools for professional development aimed at addressing specific issues in geoscience education, our partners have developed a wide variety of mechanisms for linking resources with the context required for their effective use including: tutorials that embed resource references (21, 22), topical collections of resources for specific geoscience courses (23), and modules that link information on pedagogic methods to teaching activities that use these methods (24). Partnering with projects focused on improving education provides a scalable model for addressing the social aspects of library building. In less than five years, through the work of our partners, Teach the Earth has grown to include 3,600 pages of content, over 1,000 teaching activities and 6,000 cataloged resources. A poll of geoscience faculty, a primary target audience, indicates that use extends beyond the pool of early adopters to approximately 1/4 of geoscience faculty in the US (25). International use is also strong with approximately 1/3 of use coming from time zones that do not cover the United States. A digital library is more than a collection of project websites on a common topic. We use two evolving strategies to create a digital library from the individual work of our partner projects: a set of common formats for resource elements that cross projects (e.g. teaching activities) and digital library tools that support referencing and reuse of resources across the projects. This work is facilitated by the common use, by all projects, of our web-based editing system (26) which allows projects to create websites with consistent design and coherent information architectures. Many of our partner projects are engaged in sharing teaching materials: examples of different ways of teaching a particular concept; data sets and activities that use them; and course syllabi. To facilitate sharing, we designed single page templates that summarize the information needed to use each of these types of resource effectively: ActivitySheets (27), DataSheets (28), CourseSheets (29), and FieldTripSheets (30). These sheets include information about learning goals, context for use, teaching tips, and assessment as well as other information specific to the particular type of resource. Sheets go beyond traditional descriptive metadata by including rich contextual information (e.g., how and why to use the resource) as well as links to web resources or downloadable files that enable full implementation of the activity. These sheet formats provide many of the benefits that we associate with traditional metadata due to their structure and consistency. The common format allows users to efficiently scan through a large collection of resources after gaining some initial familiarity with the standard structure. This benefit multiplies as a format is adopted by multiple collections and projects. The particular choice of required fields in each template has evolved from experience to include the information users find most valuable and to reflect educational best practice. As authors put their materials online via a sheet format, they are guided by the format itself toward reaping the benefits of insights into user needs gained by other projects and from educational research. For example, ActivitySheets and CourseSheets both emphasize goal setting, an important part of the educational design process (31). Sheets link the information needed for use of a resource to the resource itself, acting as a vehicle for sharing individual experiences with the larger community and supporting educational reuse (32, 33, 11). Sheets serve as a natural locus around which to link data, activities, references, and other information relevant to the use of a specific resource. They facilitate the creation of resource-centric, rather than metadata-centric, collections (6). Adoption of the sheet format by our contributing projects enables automated generation of searchable collections of activities, data sets, and courses across the entire Teach the Earth library, all of which share a common look and feel (34, 35). These shared formats lie at the heart of creating, what users view as, an integrated library without compromising the need of individual contributing projects to maintain their own visual identity. Equally exciting is the ease with which new vocabularies can be attached to specific sheets to create new collections addressing specific topics in teaching. For example, this strategy has been used to develop an activity collection focusing on teaching quantitative skills in the geosciences (36). By supporting this creative reuse, sheets move the library beyond a discovery service to a community resource for the generation of new ideas, resources, and knowledge. A primary goal of the library is to foster synergistic relationships between contributors. Just as authors of new books and journal articles learn from and reference the work of their predecessors, the library includes a number of tools to promote the ability of new contributions to capitalize on previous ones. These tools help contributors produce quality scholarly materials for their projects and at the same time promote connections between resources in the library in ways that add value for users. Contributors have access to a full collection of metadata records describing websites and print references that have been contributed by previous projects (including the full Digital Library for Earth System Education catalog). These records can be selected and organized using either of two tools: a resource list tool and a faceted search tool (26). Faceted search is driven by a set of overarching vocabularies as well as customized vocabularies that can be created by individual projects to address specific needs of highly targeted user communities (37, 26). This strategy has been used effectively to create collections addressing Geology and Human Health, and Geoscience and Public Policy (23, 38). The catalog record for each resource displays the location of references to it across the library (26). Thus a user who finds a resource in one context can quickly move to the other contexts within the library where this resource is referenced (39). Similarly, a contributor can understand the previous use of the reference and the implications of that work on the project at hand. Contributors can incorporate modules of material created by other projects directly in their project. The information in the module is 'wrapped' with the look and feel of their website and then embedded within that site with conventional links. The service integrates provenance information into the content, attributing authorship with the original source of the module. Projects are now employing this service to reuse modules describing teaching methods in association with discipline specific content. For example, a module on teaching with the Socratic method was developed by the Starting Point project for geoscience faculty. This module has been reused by the Microbial Life Educational Resources project as a resource for biologists (40). A related links tool enables contributors to make connections between their work and related work in other projects. This tool can be used to make associations between pages at any level of the website. For example, a project top page can reference other project top pages (41); a teaching example can reference a variety of pedagogic modules (42); or the browse interface to a collection can reference other related collections (43). This tool creates a standard format for related links across the library, again facilitating an integrated experience for users. The resulting web of resources complements traditional search and browse and the overall site architecture as a discovery mechanism for users, moving them laterally between resources. As contributors use these digital library tools to their advantage, they enable the development of a networked inter-project digital library where connections, structure and value are embedded at all scales from individual resources up to the overarching portal. Thus, the library has a different look and feel than is traditional, focusing on creating a web of resources. While an overarching portal complements this network, usage data indicate that the portal plays a secondary role in use and discovery through the library. Of 900,000 users in 2005, only 3% visited the primary portal. In contrast, interviews with users indicate that cross-site movement initiated from a point within the library where they are comfortable is an important strategy for exploring new resources. Research on information seeking behavior shows that users explore information on the web using a complex and sophisticated set of interrelated strategies (18, 44). The goal is to maximize the value of the library in supporting this exploration. 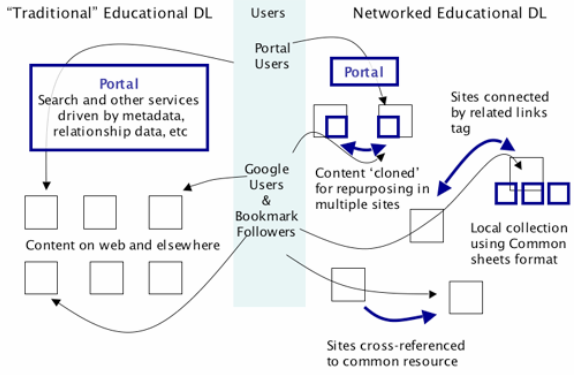 As emphasized in Figure 1, users find added value throughout the library in the form of contextualizing information and connections among resources. Figure 2 shows three different paths that users with varying needs, backgrounds, and styles of information seeking behavior might take through a specific slice of resources in the library. Arrows represent connections that are facilitated by a range of tools and features in the library design including faceted searching, highly contextualized topical collections within sites, related links tags, and embedded links. Existing user search behavior that uses Google as a touchstone is supported. The DL community continues to discuss whether DL's can offer better alternatives to commercial internet search engines such as Google (45). A resource web acknowledges the powerful and popular role that Google and other commercial search engines play in discovering resources and creates strategies that capitalize on this behavior. Teach the Earth is designed for entry via commercial search engines. The goal is to maximize the ability of users to explore the network of resources from wherever they enter. Authors and reviewers are encouraged to make sure that each page can function effectively as a first page, and care is taken to ensure that a user can understand the local content and organization no matter where they enter the site. The resource network enables exploratory searching and supports finding resources more than once. Users can explore the site using a variety of navigation elements: library wide search and browse, project-specific navigation including search and browse across topical collections, related links tags, and embedded links. From any point within the library, users can find a rich set of links for further exploration on multiple axes. In this way they can continually guide their exploration toward resources that are aligned with their interests and expectations (18). Interviews indicate that satisfaction with the site reflects confidence that users can find and refind highly relevant resources on the site. This confidence arises from the ability to navigate to the same resource using multiple pathways using redundant navigational elements. The primary challenge of this design is ensuring that users are not overwhelmed or confused. In particular, users note that they have a sense that they cannot comprehend the full scope of the site and they lack confidence that they have found all resources on the site that might be of interest. Users seeking a highly structured, linear experience, particularly those who would like a definitive list of related items such as a ranked search return, express frustration with the open ended navigation process. The typical limits of users' search behavior are circumvented, leading to increased exploration on the site. When using discovery interfaces that present resources as a list of isolated, decontextualized search returns, users may have a tendency to stop as soon as they reach a resource that seems good enough rather than digging further (46, 47). This well-documented, satisficing behavior is heavily colored by users' expectations of what might be available. The network DL model focuses on smaller specialized collections. The choices users make in moving through the site guide them to the right general vicinity where they can find small collections well aligned with their particular interests. By the time that users search and obtain a return, they have already identified the group of resources that is most likely to answer their needs. Rather than settling for the one or two resources that a broader search engine brings to the top, the small, focused collections help users gain a picture of the most relevant resources. They repeatedly find resources in the library in the course of their normal searching with a commercial search engine. Value is added by assisting them from their point of entry to other related resources of high interest. The ability of the network to support rich exploratory searching gives users the confidence that they can find resources that are aligned with their needs and interests more than one time. Thus the library becomes a trusted source and a starting point for exploration. Users are enticed deep into the library collections to find the best resources for their purpose. They learn through their exploration of the library and leave with resources that are closely aligned with their needs. Teach the Earth evolved as a digital library from the collective work of a number of NSF-funded projects focused on professional development in geoscience education. While the resulting library has features that are typical of a digital library (a metadata repository that supports a centralized portal with search and browse capacity) its unique history led to a focus on authoring tools, tools that support reuse and sharing, and a networked structure that promotes the work of individual projects while integrating them into a larger whole. This structure has been advantageous in building a value proposition for contributors who gain valued services through their participation in the library and for users who can find the integrated resources of leaders in geoscience education in ways that effectively integrate with their use of commercial search engines. As a result, Teach the Earth is sought out as a partner by new projects for the services it provides, and it is used by a significant fraction of the target community (geoscience faculty). While challenges of scalability will face the library as it matures, it provides an example of the ways in which a digital library can create an intellectual commons that is a central part of the work of an educational community. The authors are grateful to Michelle Hall, Mike Mayhew and Dave Mogk who provided thoughtful reviews of the manuscript and who have been influential in our thinking about digital libraries. We would also like to thank all of the partners who have collaborated with SERC as part of the building of Teach the Earth. This article reports results from work funded by the National Science Foundation including that taking place under grants DUE-0127141, EAR-0304762 DUE 0226243, DUE 0226199, and DUE 0532875. Any opinions, findings, and conclusions or recommendations expressed in this material are those of the author(s) and do not necessarily reflect the views of the National Science Foundation. 1. Zia, L. (2000). "The NSF National Science, Mathematics, Engineering, and Technology Education Digital Library (NSDL) Program: A Progress Report." D-Lib Magazine, 6(10) <doi:10.1045/october2000-zia>. 2. Manduca, C. A., F. McMartin and D. Mogk (2001). "Pathways to progress: Vision and Plans for Developing the NSDL: Report to the National Science Foundation," <http://doclib.comm.nsdlib.org/PathwaysToProgress.pdf>. 3. Marchioni, G., C. Plaisant, et al. (2003). "The People in Digital Libraries: Multifacted Approaches to Assessing Needs and Impact." Digital Library Use: Social Practice in Design and Evaluation. A. Peterson, N. Bishop and B. Van House. Cambridge, Massachusetts, The MIT Press: 119-160. 4. Borgman, C. L., L. J. Smart, K.A. Millwood, J.R. Finley, L. Champeny, A.J. Guilliland-Swetland, and G.H. Leazer (2005). "Comparing faculty information seeking in teaching and research: Implications for the design of digital libraries." Journal of the American Society for Information Science and Technology, 56(6): 636 - 657. 5. Lagoze, C., D. B. Krafft, T. Cornwall, N. Dushay, D. Eckstrom, and J. Saylor (2006). "Metadata aggregation and "automated digital libraries": A retrospective on the NSDL experience." Proceedings of the 6th ACS/IEEE-CS Joint Conference on Digital Libraries, ACM Press. 6. Lagoze, C., D. B. Kraffti, S. Payette, and S. Jesuroga (2005). "What Is a Digital Library Anymore, Anyway? Beyond Search and Access in the NSDL." D-Lib Magazine, 11(11), <doi:10.1045/november2005-lagoze>. 7. Borgman, C. L. (1999). "What are digital libraries? Competing visions." Information & Management, 35(3): 227-243. 8. Arms, W. (2000). "Automated Digital Libraries: How Effectively Can Computers Be Used for Skilled Professional Librarianship?" D-Lib Magazine, 6(7/8), <doi:10.1045/july2000-arms>. 9. Manduca, C. A. and D. Mogk (2000). "DLESE (Digital Library for Earth System Education): A Community Plan," University of Oklahoma: 46 p.
10. Sumner, T. and M. Marlino (2004). "Digital libraries and educational practice: a case for new models," Proceedings of the 4th ACM/IEEE-CS joint conference on Digital libraries. 11. Sumner, T. and M. Dawe (2001). "Looking at Digital Library Usability from a reuse perspective." International Conference on Digital Libraries. Proceedings of the 1st ACM/IEEE-CS joint conference on Digital libraries, Roanoke, Virginia, ACM Press. 12. Zemsky, R. and W. Massey (2004). "Why the E-Learning Boom went Bust." The Chronicle of Higher Education, 50(44). 13. Hutchings, P. (2001-2002). "Reflections on the Scholarship of Teaching and Learning." Essays on Teaching Excellence, 13(5). 14. Manduca, C.A., H. Macdonald, D. Mogk, and B. Tewksbury (2006). "On the Cutting Edge: Evolving Themes, Enduring Impact." Northfield, MN: Science Education Resource Center <http://serc.carleton.edu/files/NAGTWorkshops/cuttingedge2006.pdf>. 15. Ledley, T.S., L. Dahlman, C. McAuliffe, N. Haddad, C.A. Manduca, S. Fox, D. Blaha, R. Freuder, and R. Downs (2003). "The Earth Exploration Toolbook: Facilitating the Use of Data to Teach Earth Science Processes." Geological Society of America Abstracts with Programs, 35(6), September 2003, p. 115 <http://gsa.confex.com/gsa/2003AM/finalprogram/abstract_60188.htm>. 16. McCaffrey, M. and T. Weston (2005). "The climate change collection: a case study on digital library collection review and the integration of research, education and evaluation." Proceedings of the 5th ACM/IEEE-CS joint conference on Digital libraries, <http://portal.acm.org/citation.cfm?id=1065385.1065495>. 17. Manduca, C.A., L. Guertin, R.H. Macdonald, R. Teed (2004). "Starting Point: Resources for Faculty Teaching Entry Level Geoscience." Geological Society of America Abstracts with Programs, 36(5): 276. <http://gsa.confex.com/gsa/2004AM/finalprogram/abstract_77271.htm>. 18. Marchioni, G. (2006). "Exploratory Search: From Finding to Understanding." Communications, 49(4): 41 - 46. 19. For more information about the On the Cutting Edge Faculty Development Program, see <http://serc.carleton.edu/NAGTWorkshops/about.html>. 20. Manduca, C. A., E. Iverson, S. Fox and F. McMartin (2005). 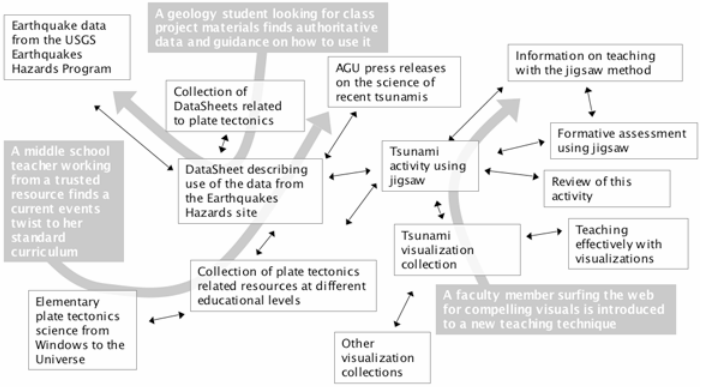 "Influencing User Behavior through Digital Library Design: An Example from the Geosciences." D-Lib Magazine, 11(5). <doi:10.1045/may2005-fox>. 21. See for example, the On the Cutting Edge module on Designing Effective Online Educational Resources in the Geosciences, <http://serc.carleton.edu/NAGTWorkshops/webdesign/index.html>. 22. See for example, the Earth Exploration Toolbook website, <http://serc.carleton.edu/eet/index.html>. 23. See for example, the On the Cutting Edge module on Geology and Human Health, <http://serc.carleton.edu/NAGTWorkshops/health/index.html>. 24. See for example, the Starting Point module on Interactive Lectures, <http://serc.carleton.edu/introgeo/interactive/index.html. 25. Iverson, E., C. Manduca and S. Fox (2005). "SERC Results of an Email Poll." Northfield, MN, Science Education Resource Center, <http://serc.carleton.edu/files/NAGTWorkshops/email_poll.v2.doc. 26. Fox, S., C. A. Manduca, and E. Iverson (2005). "Building Educational Portals atop Digital Libraries." D-Lib Magazine, 11(1). <doi:10.1045/january2005-fox>. 27. Examples of ActivitySheets, <http://serc.carleton.edu/introgeo/teachingwdata/examples/satimg.html. 28. Example of DataSheets, <http://serc.carleton.edu/usingdata/datasheets/TOXMAP.html>. 29. Example of CourseSheets, <http://serc.carleton.edu/NAGTWorkshops/coursedesign/goalsdb/12058.html>. 30. Example of FieldTripSheets, <http://serc.carleton.edu/nagt/field/fieldtrips/geo-ny.html>. 31. Wiggins, G. and J. McTighe (2000). Understanding By Design, Prentice Hall. 32. Robson, R., G. Collier and B. Muramatsu (2004). "Reusability Guidelines." Covallis, OR, Reusable Learning, <http://www.reusablelearning.org/docs/nsdl/workshops/may04/guidelines-v2.9.pdf>. 33. McDaris, J., S. Fox and C. A. Manduca (2004). "Supporting Reusability." Tucson, AZ, 2004 Joint Conference on Digital Libraries, June 2004. 34. See for example, the Teach the Earth Search the Site page, <http://serc.carleton.edu/teachearth/search_tte.html>. 35. See for example, the Using Data in the Classroom Activity Browse page, <http://serc.carleton.edu/usingdata/activities.html>. 36. See for example, the Teaching Quantitative Skills in the Geosciences Activity Browse page, <http://serc.carleton.edu/quantskills/teaching_resources/index.html>. 37. Iverson, E., C. Manduca and S. Fox (2005). "Evaluating Vocabulary as a Component of Faceted Search." 2005 NSDL Annual Meeting, Denver CO, <http://serc.carleton.edu/files/serc/iverson-nsdl05.pdf>. 38. See for example, the On the Cutting Edge module on Teaching Public Policy in the Earth Sciences, <http://serc.carleton.edu/NAGTWorkshops/publicpolicy/index.html>. 39. See for example, the digital catalog record for How People Learn: Brain, Mind, Experience, and School published by National Academy Press, <http://serc.carleton.edu/resources/405.html>. 40. See for example, the Microbial Life Educational Resources Teaching Activities page, <http://serc.carleton.edu/microbelife/teaching/index.html>. 41. See for example, the Teaching Quantitative Skills in the Geosciences website, <http://serc.carleton.edu/quantskills/>. 42. See for example, the Starting Point module on Teaching with Models, <http://serc.carleton.edu/introgeo/models/index.html>. 43. See for example, On the Cutting Edge module on Teaching Hydrogeology in the 21st Century Activity Browse page, <http://serc.carleton.edu/NAGTWorkshops/hydrogeo/activities.html>. 44. Borgman, C. L., L. J. Smart, K. A. Millwood, J. R. Finley, L. Champeny, A. J. Gilliland-Swetland and G. H. Leazer (2005). "Comparing faculty information seeking in teaching and research: Implications for the design of digital libraries." Journal of the American Society for Information Science and Technology, 56(6): 636-657. 45. Lossau, N. (2004). "Search Engine Technology and Digital Libraries: Libraries Need to Discover the Academic Internet." D-Lib Magazine, 10(6). <doi:10.1045/june2004-lossau>. 46. Zach, L. (2004). "When is enough enough? Modeling the information-seeking and stopping behavior of senior arts administrators." Journal of the American Society for Information Science and Technology, 56(1): 23 - 35. 47. McMartin, F., E. Iverson, et al. (2006). "Factors Motivating Use of Digital Libraries." Proceedings of the 6th ACM/IEEE-CS joint conference on Digital libraries, ACM Press.